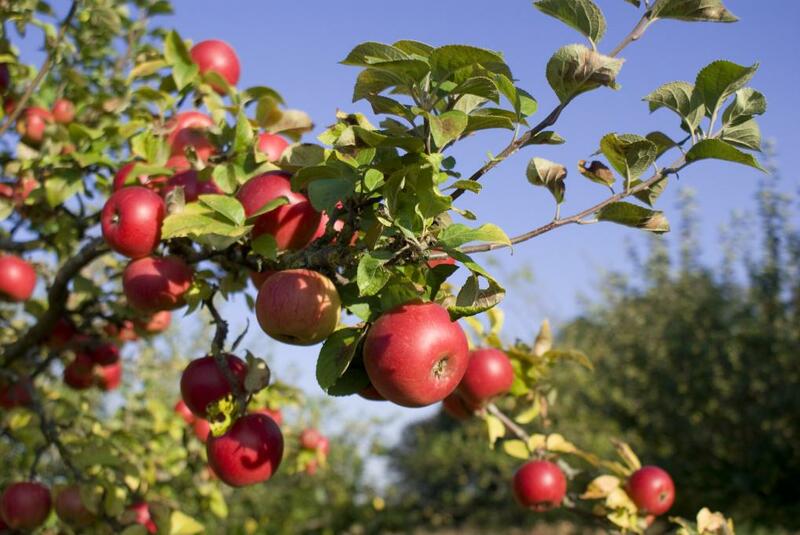 Fruit trees will look after themselves if you do the following things. So you’ve decided that you’re going to plant some fruit trees, you’ve placed the order, and you know that you’ll receive the trees some time from November to April, the ideal planting time when the trees are dormant. Now is the time to prepare the planting site! Check the pH of the soil. It should be between 6.3 and 6.6. Garden centres stock inexpensive pH meters. Set out the planting positions, with tall bamboo canes, well before the trees arrive. You’ll have worked out the planting plan and the distances between trees with your supplier. Remove one square metre of grass sward for each tree position and remove this grass totally from the planting position. The reason is that the grass roots compete fiercely with the tree, and tend to stop the tree from establishing itself on the new site. Newly planted trees and grass are BAD companions! Grass roots are very bad for the trees in the early years, when the trees need all the water available. Break up the topsoil and loosen the subsoil over 1 square metre for each tree. This is very important as tree roots hate stagnant water during the winter months. Keep the soil of the tree positions free from weeds for the rest of the season and for two years after that. The planting hole needs to be at least 1’6” in diameter and approximately 6” deep. Only put the best top soil on top of the roots. No subsoil. Loosen the subsoil with a rigid tine fork, before you plant the tree. While the soil is reasonably dry, this is the best time to put the stakes in place near the planting positions. Set a stake upright in the middle of each 1 square metre. The stake needs to be 2” in diameter, 1’6” in the ground and 4’6” feet above the ground. Total length 6 feet. If you think that you won’t be able to plant the trees straight away when they arrive, you’ll have to heel them into a shallow trench 8 inches deep and 6 inches wide. Good drainage is absolutely essential for the trees to thrive. If drainage is suspect on your site, the trees will have to be planted on a mound. The height of the mound needs to be at least 10 inches above soil level and 3 foot wide in diameter. Only use the best topsoil to construct the mound.